PixelTools products can insert and extract the old Analog Line 21 Captions into and out of a MPEG video. Insertion of Analog Line 21 captions must be burned into the video. This can be accomplished during encoding or transcoding using one of the PixelTools encoders such as MPEGRepairHD or Expert-Broadcast. Extraction of Analog Line 21 captions to a .scc or .txt file can be accomplished by a PixelTools decoder such as Expert-Caption and MPEGRepairHD. MPEGRepairHD can insert analog captions into video during encoding or into an existing video during transcoding. Your captions must have been transcribed and formatted into a .SCC file or a text file. The analog captions can be inserted into any line of the output video. and then adjust the parameters (bit-rate etc) per your specific encoding specifications. Browse for your Encode source and set your Encode Output name. 3. 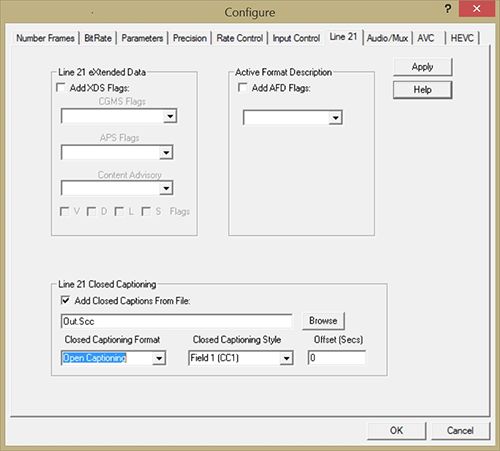 Finally select the PreProcess | PreProcess Input dialog and enter the line you desire to hold the analog captioning in the "Extract of Add Analog Closed Captions" edit box. Note that the original analog line 21 data is often inserted in line 28 of the encoded video. Line 21 captions refers to one of the old unused lines of analog televisions and has no direct correspondence in MPEG compressed video. Start the encode process by depressing the Encode Run button. If you open the Statistics window (depress the ST button) you should see reports of the captions being inserted into the video as below. If you do not see the above messages, it could be that the starting time code of your encoded MPEG file does not correspond with the starting time code of your .SCC or text file. 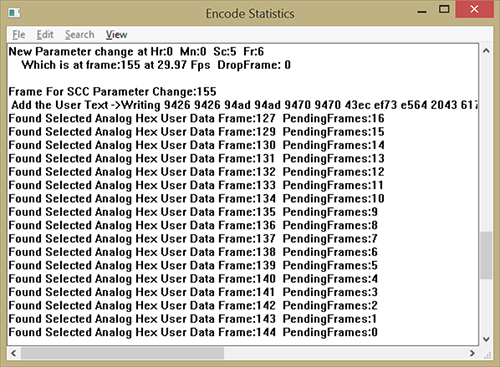 You can easily adjust the encoded MPEG starting time code in the Optimize Encode | Configure | Parameters dialog box. With MPEGRepairHD set up as detailed above, the output video will be elementary video with analog captions on your selected line. You can monitor this during the encoding by opening the Encode Output window (depress the "Ou" speed button). You can also verify this by using MPEGRepair to Decode the file and open the Decode window (depress the "de" speed button). To view the captioning text rendered from the analog captioning lines, drag and drop or browse your analog captioned file into the File to Decode GUI edit box, select the line number containing the analog captioning in the Extract Streams | Save Analog Data | From Line edit box, open the Decode window by depressing the de speed button at the top of the GUI and open the windows’ menu item Text Overlays | Closed Captioning | Analog. Depressing the Decode Run button should cause your video to be displayed and the text represented by the analog captioning overlain over the decode video. PixelTools products can be used multiplex audio tracks with the captioned video. PixelTools decoder products such as MPEGRepairHD and Expert-Caption can be used to extract Analog Line 21 captions embedded in MPEG video as a .SCC file. 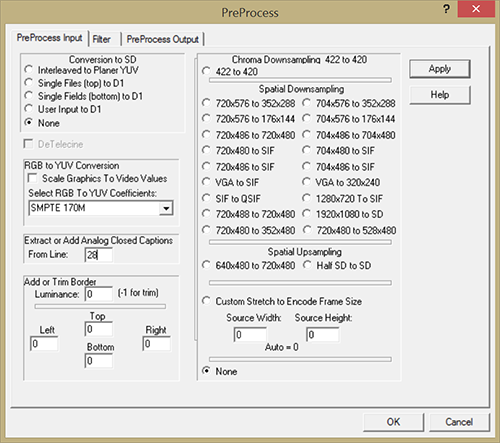 In MPEGRepairHD and Expert-Caption, select the Configure | Decode | Extract Streams | Save Analog Data check box. Enter the actual line number containing the analog captions. (This is usually NOT line 21!). Enter the name of an .SCC file to save the captions. Select the Decode Configure | Disable Decode to speed up the process. Depress the Decode Run button with your video containing the analog caption selected in the File to Decode or Analyze edit on the GUI. The analog captions will be extracted from each frame and saved in your desired .scc file. 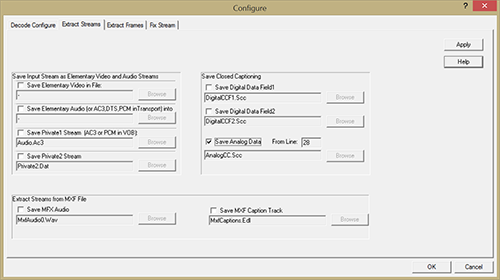 PixelTools decoder products such as MPEGRepairHD and Expert-Caption can be used to read the analog captions from each frame and insert the equivalent digital captions into the user_data for each frame. without transcoding the video. Set the Decode Configure | Fix Stream | Xcode Analog Captioning from line check box and enter the appropriate line number containing the analog captions in the associated edit box. 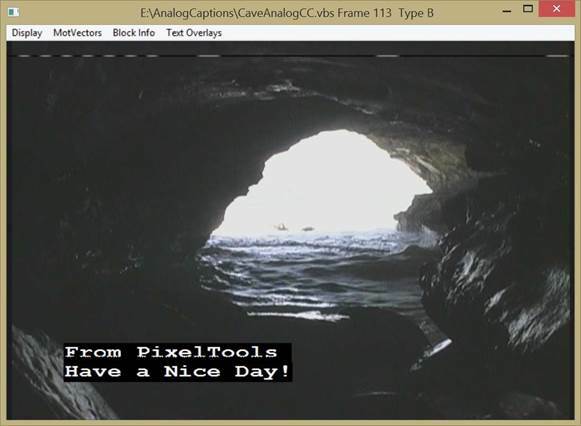 (The Analyze feature of PixelTools products can be used to determine the line number containing the analog captioning. ) Select the Decode Configure | Disable Decode to speed up the process. Depress the Decode Run button with your video containing the analog caption selected in the File to Decode or Analyze edit on the GUI. The source file will have the appropriate digital captioning inserted each frame. embedded in one of the video lines into the appropriate text overlain on the decoding video. Using this feature, you can verify the analog captions. Analog. Depressing the Decode Run button should cause your video to be displayed and the text represented by the analog captioning overlain over the decode video. Let us know if you would like a demo of any of our products or you have questions or comments about our tools. View our products features at a glance. Visit our products page and check out at our PixelTools Store to purchase any of our products. MPEGRepairHD, Expert-HD, Expert-Caption and Expert-Broadcast are trademarks of PixelTools Corporation. All other brand names are trademarks or registered trademarks of their respected holders.